New data from global pioneer of telematics car insurance, insurethebox, suggests that young football fans take their eye off the speedometer and put their foot on the accelerator ahead of a big game. According to insurethebox analysis, instances of speeding among their predominantly 17-24 year old drivers increased by over a fifth in the hour before England matches at the 2018 FIFA World Cup. With the football season underway, data from insurethebox can help fans understand that no matter how important the game, they could be scoring an own goal if they don’t keep to the speed limit. While speed does have its uses on the pitch, outside of the game the consequences can be severe. Over half of all serious accidents on country roads involving 17-24 year olds are due to loss of control, largely due to speeding. The UK government’s 2016 report on road casualties revealed that 1,792 people were killed – a 4% rise in speed related road deaths year on year. 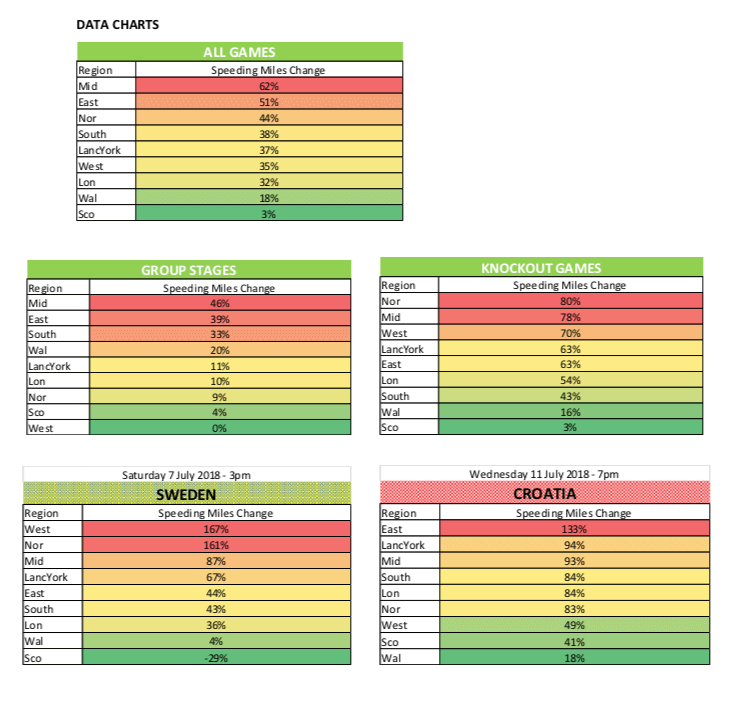 During the World Cup, young drivers from the Midlands sped the most: during the group stage games their speeding increased by 46%. This increased further through the knockout stages as England gained momentum, with speeding up by a massive 78%. Young drivers in the East of England ranked second overall, with a 133% increase in speeding before the Croatia semi-final – the highest in the country for this match. Unsurprisingly, young drivers in Scotland and Wales ranked lowest in the speeding league table. London drivers also recorded relatively low changes in speeding – perhaps influenced by congestion and the wider availability of public transport. 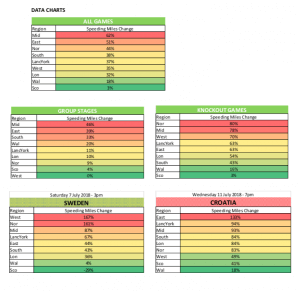 However, while young drivers in the West of England appeared to stay within the speed limit during the group stages, when the weekend hit and England played Sweden, there was a 167% increase in the hour before the game. Fans in the North were also more excited by the Sweden game, recording a 161% increase in speeding. The insurethebox analysis suggests that the level of speeding among 17-24 year old drivers during the England World Cup campaign was largely dictated by the importance of the game. In the hour before England played Belgium, the likelihood of young drivers speeding increased by 7%. However, before England’s semi-final against Croatia, there was a 43% hike in young motorists speeding and young motorists spent 1 in every 5 miles speeding compared to the usual average of 1 in every 9 miles. Weekend matches also signaled a sharp rise in speeding. Across the tournament there was a 30% increase in the amount of speeding per mile before any weekend game. This is especially important for football fans in the UK, as games are most commonly played on weekends. While speeding during the tournament can largely be attributed to young men, who increased their speed by an average of 38%, speeding among women drivers also increased by 31%. Simon Rewell continued: “Using analysis of more than 4 billion miles of driving data that insurethebox has collected over the last 8 years, we know that young drivers are four times more likely to crash in the first three months of their policy than their final three. insurethebox proactively contacts drivers who speed, giving them the information they need to manage their driving behaviour and reduce their risk of an accident. 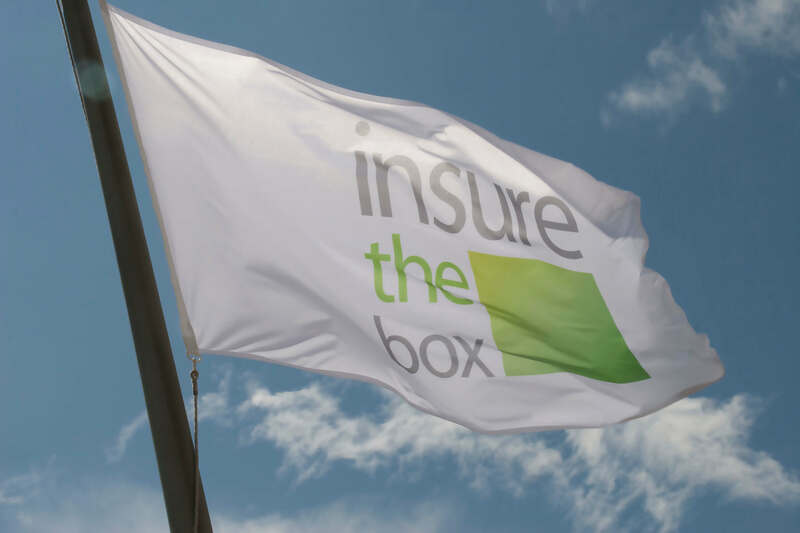 Through a telematics black box installed in the vehicle, insurethebox uses individual driver data to determine the risk profile of each policyholder and calculate their premiums. insurethebox shares driving data with customers through a personalised online portal, empowering them to better manage their driving habits in order to reduce their risk profile – and therefore their premiums. insurethebox policies offer an initial 6,000, 8,000 or 10,000 miles of cover and bonus miles can be earned for good driving behaviour.